Kinda big news: My new book The Sorcerer From California is now available in paperback and Kindle edition. 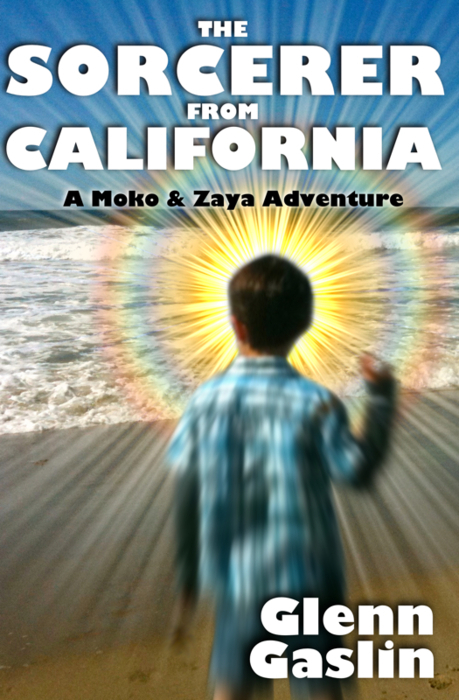 It’s the first of a series I’m calling the Adventures of Moko & Zaya, and it’s based on stories that I told my son Zev when he was 5 (more on how that all came about later). The keys to these stories were always: Cliffhangers, high adventure, and lots of monsters. We came up with so much material that I have about seven books mapped out, mining the best and strangest stuff (Kings of the Volcano is next). Anyway, check it out. If you dig Sorcerer, please drop me a review on Amazon, cool? A mysterious bracelet! A lost island! An evil queen! California kid Moko spends his days quietly doodling monsters and exploring the beach on his bike. Until an unexpected gift sends him on a harrowing adventure! He soon finds himself transported, though his dreams, to a world filled with danger, magic and really strange creatures. The place is as real as his hometown of Oso Beach, and here Moko meets fat flying ladies, morphing mud creatures and a mischievous cyclops named Chuck. But can he save their fragile isle from a shadowy invader and her flying fortress? And why is that annoying girl Zaya from his karate class here, too? As their dreams begin to merge, two kids from a sleepy beach town must master a strange world’s magic and defeat the shape-shifting menace known as Mafibious. But are they too late? Find out, as the adventures of Moko and Zaya begin! Get it: In paperback and Kindle edition.